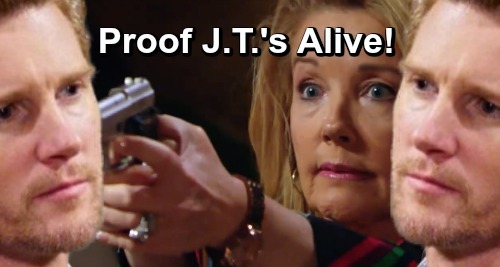 The Young and the Restless (Y&R) spoilers tease that the pressure will rev up for Nikki Newman (Melody Scott Thomas Scott). She’s already on edge after finding that fireplace poker at the ranch. It looks just like the one Nikki used to kill J.T. Hellstrom (Thad Luckinbill), so it’s easy to see why she’s concerned and determined to take down the threat. Whether the real deal was retrieved from the lake or simply replicated, someone out there knows the truth – including the exact murder weapon used to kill J.T. That seems like another piece of proof that J.T. himself is alive and well. Only J.T., Nikki, Victoria, Sharon Newman (Sharon Case) and Phyllis Summers (Gina Tognoni) were in the room that night. The cops searched the place over and seemingly only missed the garage camera, so there probably wasn’t one upstairs. The only transmissions Tessa Porter (Cait Fairbanks) found came from the garage cam and the portable GPS that led her to the burial site. That doesn’t leave many options. If there are any persistent doubts in your mind about Tessa, go ahead and put them to rest. Tessa wasn’t even 100-percent sure J.T. was dead until Nikki proved it with her payment. She seemed genuinely puzzled about what went down that night, so it’s doubtful she was holding out on Mariah Copeland (Camryn Grimes) during their honesty hour. Besides, she’s expressed remorse and Y&R is moving on. Even if someone learned the truth by eavesdropping, he or she wouldn’t have known the fireplace poker details right down to the color and type of metal. That means Phyllis was either followed when she disposed of the murder weapon or the tormentor was there to see it when the deed was done. The latter seems to be the most likely. In other words, it appears this has to be J.T. or an actual member of the girls’ night gang. Nikki and Victoria are in the clear. We can count also count out Sharon, who feels terrible about Victor Newman (Eric Braeden) being locked up. Sharon has always been the most frazzled and weak of the ladies. There’s no way she’s double-crossing all of them. Phyllis, on the other hand, could be betraying her crew. The Young and the Restless fans wouldn’t put it past her since she’s quite the schemer. However, Phyllis was willing to attempt to move the body. She seemed in the dark about it not being in Chancellor Park anymore. Plus, Phyllis was busy when J.T.’s clothes were placed in Nikki’s bed and just before the fireplace poker showed up. She probably wouldn’t have had time to plant them. Unless Phyllis is working as J.T.’s partner, she wouldn’t have had access to his blood for the shirt that was found either. Finally, we’ve got the surveillance feed evidence. Someone watches Nikki and Victoria through a video feed in Tuesday’s episode, January 15, so that lines right up with security expert J.T. Even with the extra security Nick put in place, J.T. would likely be one of the few people able to keep slipping under the radar. That would explain how the tormentor kept getting on the ranch to plant evidence, too. Bottom line, it’s looking more and more like Nikki’s target is now making her one. If J.T.’s really alive, how long will it be until he comes out of hiding? When will Nikki face the man she took down? The Young and the Restless spoilers say this storyline has another round of bombshells in the works, so stay tuned. We’ll give you updates as other Y&R news comes in. Stick with the CBS soap and don’t forget to check CDL often for the latest Young and the Restless spoilers, updates, and news.